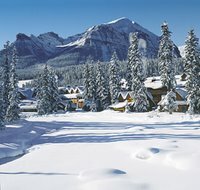 Originally built in 1942, the Post Hotel and Temple Mountain Spa is situated amidst the natural wonders of Banff National Park. Canada’s largest ski area is just minutes away and the abundance of snow is one reason guests from around the world visit the area each winter. An award winning wine list, and fresh market cuisine are featured in the Post Hotel's renowned dining room.